Oil on canvas, 34 x 38 cm. Like his old teacher C.A. Lorentzen, Wilhelm Marstrand worked on illustrations for Ludvig Holberg’s plays. 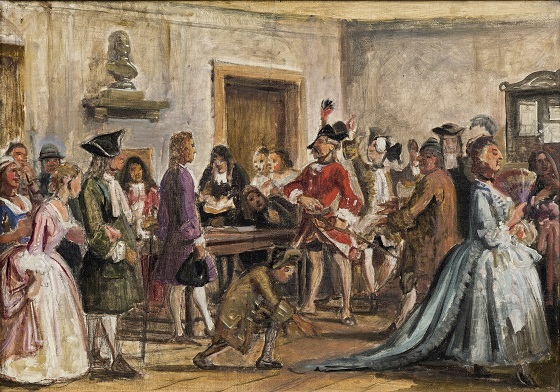 This sketch depicts a scene from Det lykkelige skibbrud, where the poet Philemon is brought before a court for his satirical poetry. He is later acquitted by the judge, and the conclusion is that satire makes a contribution to society rather than having a detrimental effect. This was also part of Marstrand’s motivation behind illustrating Ludvig Holberg’s satirical plays. Marstrand believed in the educational effect of art, and in Holberg’s popular comedies, he found subjects that also had an educational impact.